In Part I (link here), we started off on the road to “Integrated Business Planning” (IBP) by posing 5 fundamental questions that need to be answered in evolving a strategic supply chain road-map. Links to other parts are here (Part II) and here (Part III). In Part III, we looked at the ongoing disruptive technological innovation. In this article, let’s take a brief look at the implications of disruptive innovation on the supply chain enablement for any business. Most important thing to realize about technological innovation is that, by itself, it does not have a significant impact until it is translated into a business innovation that is a game changer for your competitive environment. History is replete with many examples of this. First patent for the original sewing machine concept was granted in 1846. There was a lot of technological innovation in the next few years – each was a key to the eventual success of the sewing machine that is used today. However, the early years were spent in fighting patent battles with each other until someone came up with the first business innovation of converting the “patent thicket” in to a “patent pool”. Four stake holders agreed to: (1) merge their business interests in 9 patents, (2) charge a single, reduced licensing fee – down from $25 (about half the cost of the machine then) to $5 a decade later – and (3) divide the licensing revenue in the proportion of their contribution to the final design. This allowed (1) more manufacturers to enter the business, (2) increase the supply of machines and licensing revenues and (3) reduce the cost of sewing machines due to competition. Yet, not all four stake holders made it big in the long run. Why? The 2nd and even more important business innovation came when the original & later incarnations of Singer Manufacturing Company created a “hire-purchase plan” i.e., the first installment-payment plan in the United States for customers who could not afford the up-front payment for the machine’s high price and a “door-to-door sales” model to demonstrate the machine’s value. Singer encouraged customers to buy newer models by buying back their older models. It also expanded rapidly in international markets and opened factories globally to reduce import duties and transportation cost. Centralized decision making / planning and decentralized execution was quite a business innovation for those times. 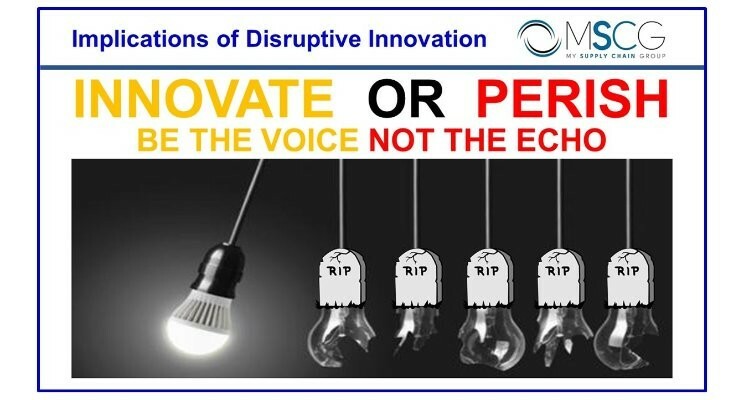 The point here is that while a company may not be the innovator of the disruptive technology, it can translate the technological innovation into a business innovation unique to its competitive ecology and ride the disruption as the leader instead of being forced to follow others in that evolution. Supply chains of customer-centric organizations must evolve to meet the demands of “mass customization” to ensure user-specific online or offline experience. Similarly, “pricing models” will have to evolve to profitably serve the lot size of ONE ! Managing the “anytime, anywhere, value pricing, high service” expectations of customers is forcing companies to quickly identify & eliminate redundancies in their “lean + agile” supply chain networks to ensure complete, accurate and on-time deliveries. Key to long-term success of a company lies in (a) incorporating innovation in to repetitive orchestration of its integrated business planning process and (b) ensuring sound solution architecture plus high maturity levels of its resources and processes to execute those plans. There are serious implications – both for companies and individuals – for the number and types of jobs that will be around a decade down the road and the skill-sets required to keep up with these changes. Positive effects of disruptive innovations will have to be balanced with risk-mitigation against their exploitation for anti-social or evil purposes. Eliminating security risks to avoid their catastrophic consequences will be an on-going challenge but cannot be an excuse for disengagement. Change management and process re-engineering challenges posed by these innovations are enormous, unavoidable and can be underestimated only at a corporation’s own peril. Riding the change requires creation of a company culture that harmonizes perpetual, smart risk taking with realistic risk mitigation. Implications of recent and on-the-horizon innovations for your supply chain will act like a two-way sword. Not internalizing these innovations will create a strategic advantage for competitors and can prove to be the death knell for any business. On the other hand, internalizing these innovations to re-invent the DNA of your company into a lean and agile business model will also have its own set of challenges on all fronts (people, processes, platforms, policies and performance). Smart executives will realize that this is a false dilemma (illusion of choice) since failure to embrace innovation and the associated change is never really a sustainable option !